Hi everyone! 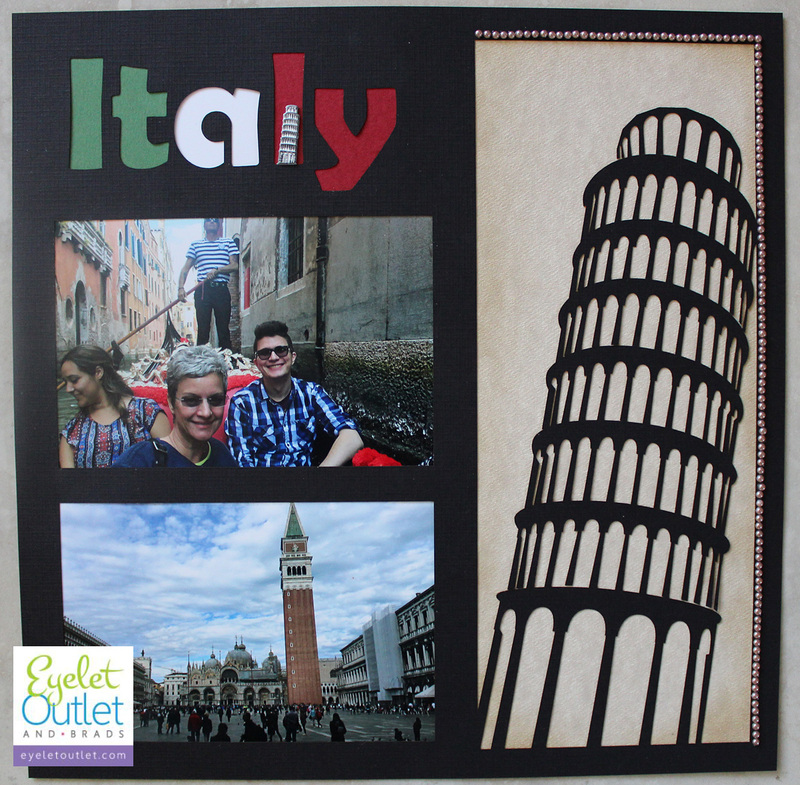 It's Deb, here with a scrapbook layout combining Eyelet Outlet embellishments with EZ Laser Designs. 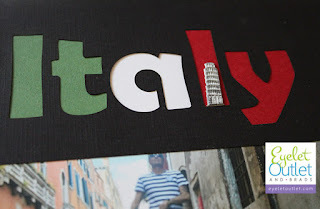 I have over 1000 photos from our trip to Italy! I was thrilled to find that EZLaser had some laser-cut layouts that would be perfect for showcasing some of my favorites. This two-page spread is the beginning of a five page span that contains about 40 photos. 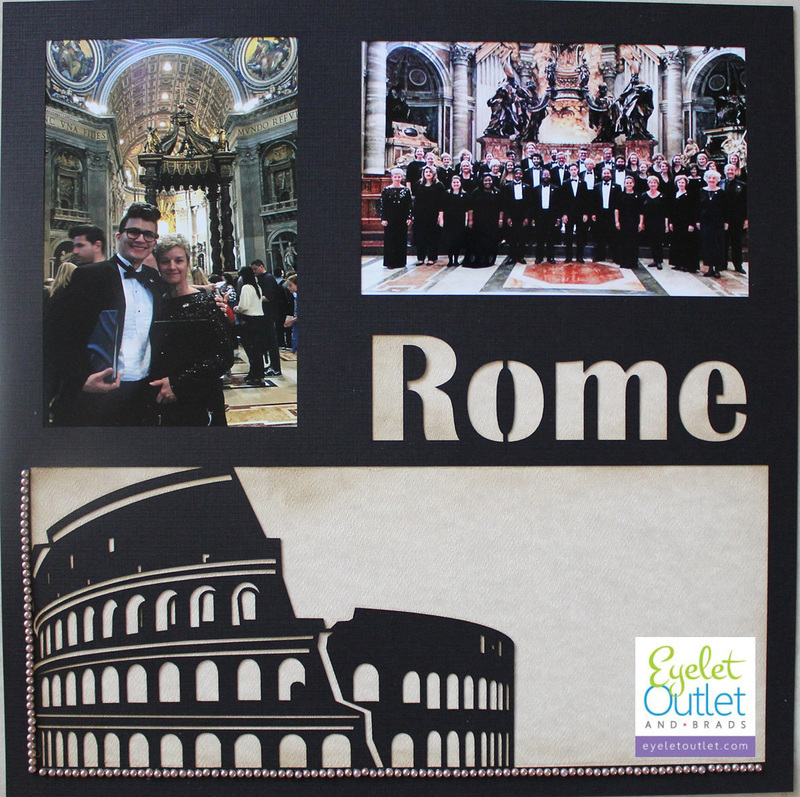 The first two photos, on the left hand side in a page design titled Rome, are photos of our chorale in St. Peter's Basilica. The setting was very elegant and ornate, so I chose to keep my layout rather simple and embellish only with a few strands of pearls placed in the lower left corner. The space behind the laser-cut design of the Colosseum is backed with some parchment-like scrapbook paper. One of my souvenirs from the trip is a lovely dip calligraphy pen, so once I've gotten some practice with it I plan to go back and document, in a pale monochromatic ink, the details of our trip. Unfortunately, we did not get to see the Leaning Tower of Pisa, but I still wanted to use the Italy title and this iconic landmark in my layout. The photos are from Venice's St. Mark's Square and our gondola ride. More pearls frame the upper right corner, where there's more room to continue documenting our itinerary, and I'll be sure to mention how disappointed we were to be so close to Pisa (we performed in Lucca) and still not get to see it. The Italy title was the perfect spot to include the colors of the Italian flag. The vertical lettering and the contrast of the colors really accentuate the leaning of the tiny Pisa brad. I love how fast and easy the laser-cut designs made putting these two pages together! I'll be back to show you the remainder in another post! School's out and Summer is here (it'll be official in less than two weeks)! For a lots of us, that means packing up the family and taking a trip or two! For this month's Challenge Chicks' challenge, I'm inviting you to make a project that's travel-related. 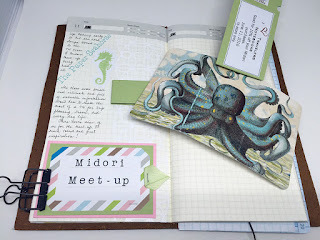 I'm working on my Midori Traveler's Notebooks. I have three going at the moment! 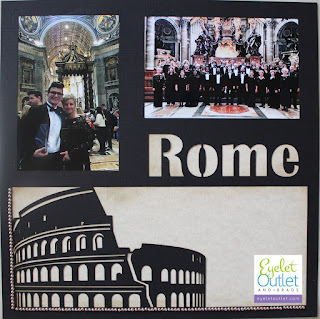 One is for our big Italy trip, and it's got photos, travel brochures, and lots of journaling in it. The cover is classic, elegant black leather, and I altered the inserts with black and gold designer papers and washi tape. That one I'll be working on for a while, and I'll be sharing more about it soon. The inserts are the beauty of the TN set-up, which has elastic bands instead of rings. 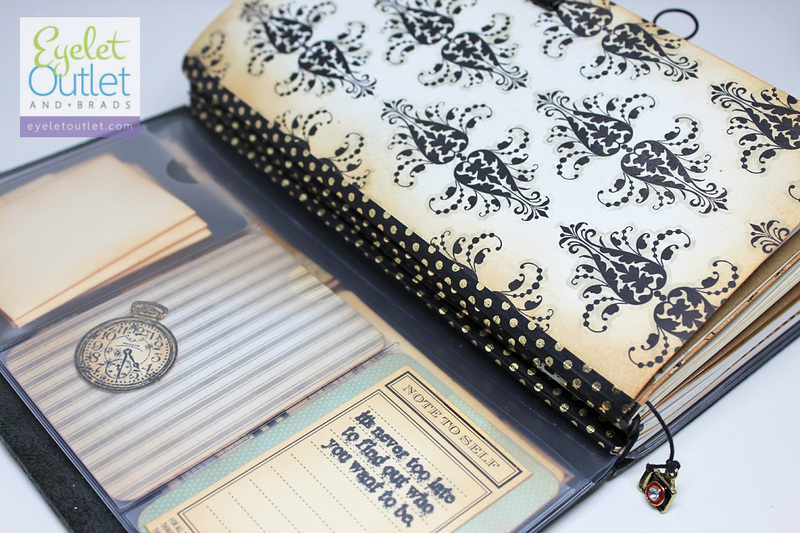 You can carry one insert, or add several using special bands, customizing your planner/journal to work just for you. 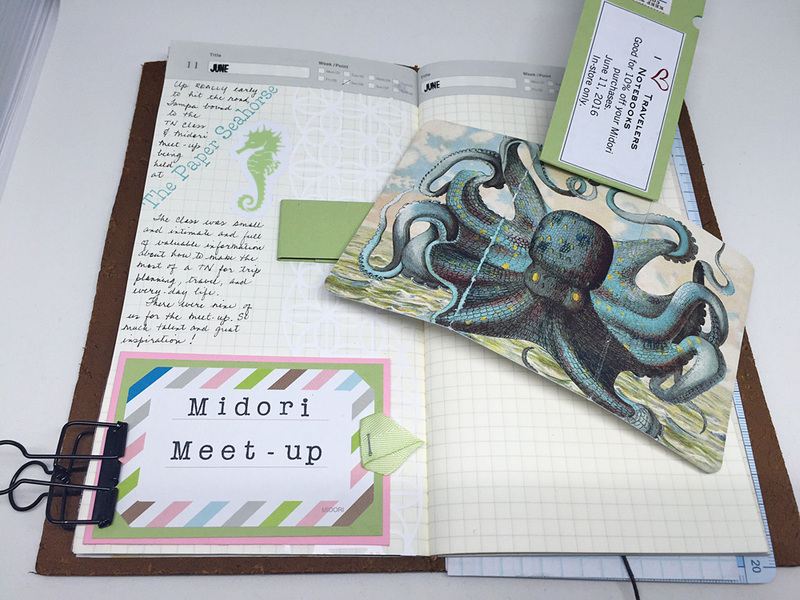 Yesterday I took a trip to Tampa to The Paper Seahorse for a Traveler's Notebook class and a Midori TN Meet-Up. It was so fun! I met some incredibly creative, talented journalers. It felt so great to be with others who are as travelers-notebook-obsessed as I am now, and to listen intently as they spoke of their journaling experiences and recommendations. 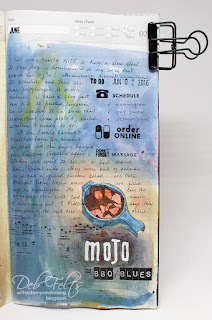 The layout about that trip is in my camel-colored leather, standard-sized every-day journal, which contains a page-a-day insert of sketches/watercoloring, photos, stamping, and highlights of my days. All of the girls at the meet-up signed a postcard, and Tona gave us some stickers and a little cat clip that I wanted to include in my layout. I also had more pictures from my trip than would fit on my page-a-day format (some refreshing Tito's berry lemonade and a delicious lobster and avocado lunch across the street at Cask Social Kitchen, Paper Seahorse's Traveler's Notebook "heaven" plus our group photo), so I had to find a way to fit all of that in. I scored the postcard in thirds, then cut a tag the same width as a cover, placing one photo on top, and a coupon and ticket sticker on the back. When folded, the postcard slides into a band that secures it to the page with the tag hanging freely. More photos go on the inside of the flip-out title. My third journal is a smaller Passport-sized journal which currently holds an analog "month-at-a-glance" calendar and some bullet journaling for to-do's, etc. Most of my schedule goes into my iPhone but there are things that are simpler to keep track of on paper, and I'm always keeping lists about something! The big list that I'm working on right now is a packing list, bullet-journal style, that will work for multiple trips. I'll just washi-tape it to the travel journal in use at the moment so that it's moveable when that journal fills up. My friend, Hope, and I are headed to Louisiana in a few weeks, and I hope to have my list complete by then for a test-run. If you are looking for a planning system that is flexible and customizable to fit your needs, that you can simplify to make into something lightweight that will also serve as a take-everywhere-everyday or when-you-travel journal, then I recommend you check out Traveler's Notebooks. Welcome to day seven of Blogs for Boobies. We are so glad that you joined us today. This is a one-of-a-kind-blog (hop) bounce! Every card/project that is show here in the “blogs 4 boobies” blog bounce is up for auction! All of the money raised through the silent auction, on our blogs, will be donated to the Susan G. Komen foundation. Skipping Stones Design is also donating $2 to the cause for EVERY stamp set sold during June 1st-14th. SSD is celebrating “Blogs 4 Boobies” with the release of 6 ALL NEW Stamp sets. You can help by Shopping! For every stamp set that you purchase during June 1st through the 14th SSD will donate $2 to the Komen Foundation. 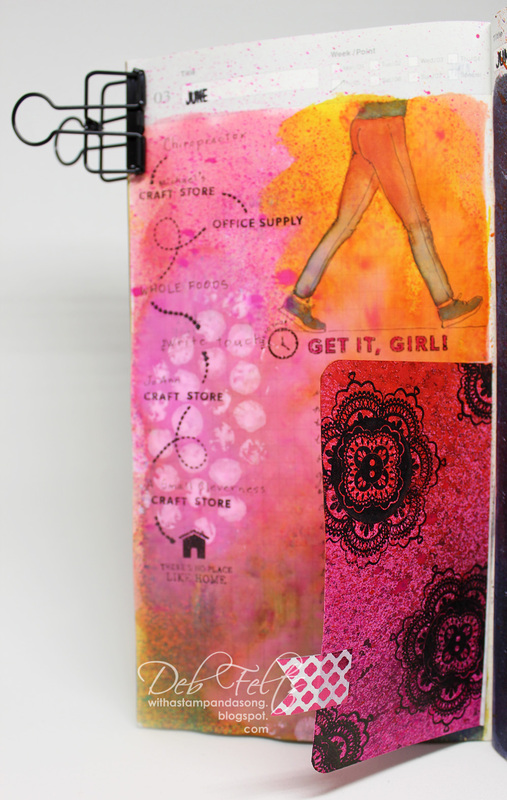 Stamping and shopping that you can feel good about! You can help by *Bidding! Help us raise money for the Komen Foundation by *bidding on a project or card along the blog bounce (hop). YES! EVERY Single card/project along the blogs for boobies bounce is up for auction. We recommend a starting bid of $5 or more. Your *Bid not only includes the card or project but shipping to your home as well. Please Note IF you want to bid, and live outside the U.S. we would request that you pay the difference of shipping charges between where you live and what it would cost to ship within the US. * See "how to place a bid" below for more detailed instructions. If you are the highest bidder 7 days after the first post date 8:00 p.m. mountain time then you WIN the card/project that you bid on. You can help by Telling Your Friends~Help us spread the word about “blogs 4 boobies” the more people that know, the more money we can raise!!! I have made two cards to be auctioned together to one winning bidder. 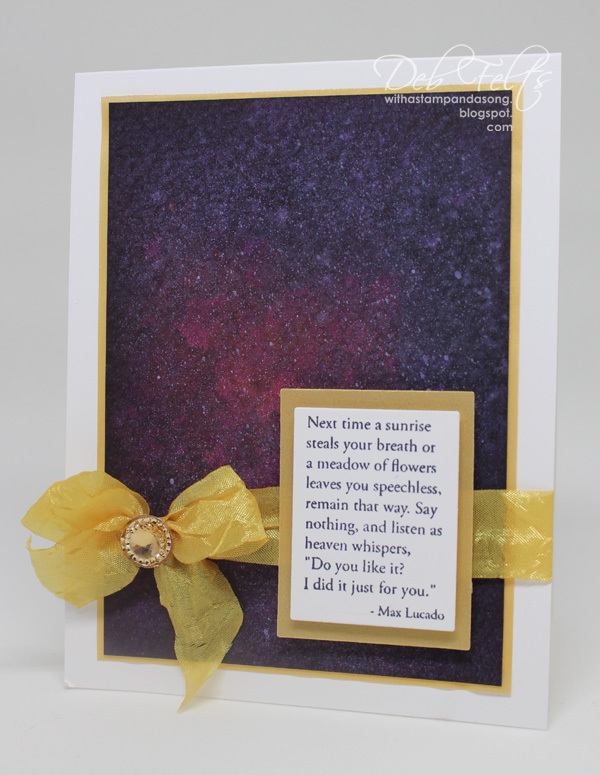 The first is a simple yet elegant design with a powerful sentiment from SSD's set, Uplifting. 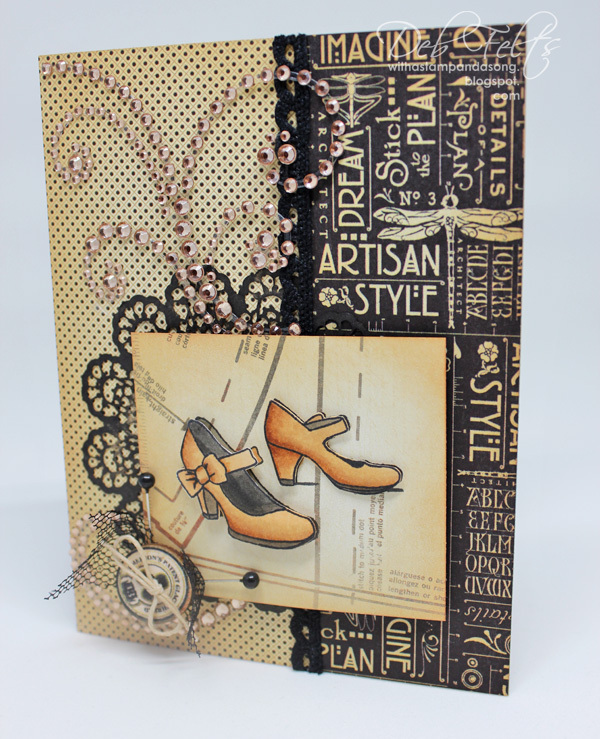 My second card is in my most favorite color combination, craft and black, featuring SSD's Sassy Shoes. I love how the elements of this card work together..."artisan style" designer paper, some black lace, tulle, sparkly champagne-colored rhinestones, a spool-top button and some straight pins. The sentiment inside says "friendships like ours never go out of style!" Find the comment section of the blog that shows the “Blogs 4 boobies” card or project that you want to buy. *Please note you may only bid on the card/project shown in the specific “blogs 4 boobies” post. *Any bids not placed on the correct post will be considered invalid. Once you are in the "blogs 4 boobies" comment section fill in the dollar and cents amount of what you are willing to pay for the card/project. We recommend a starting bid of $5 or more. Remember your bid includes shippingas well as the card/or project. 100% of the money your bid will go to the Susan G. Komen Foundation. Next to your $ bid please type in your email address. During a silent auction bidders sign their name next to their bid. Typing your email address is the electronic equivalent of signing your bid. Also it will help the blogger contact you if you are the highest bidder. Once you have entered your bid/comment sit back and wait. If someone out-bids you then you may bid again. Bidding will continue until 8:00 p.m. Mountain time 7 days after the first post. * Please note that the participating stampers/bloggers will probably re-post their Blogs 4 Boobies card/project during the week of bidding in June. When the blogger re-post their project then the bidding will continue on the NEWEST post and that comment section. "What do I do once I place a bid?" The "Winner of the Auction" will be the highest bid (that includes an email address) in the comment section of the MOST RECENT blogs 4 boobies post at the end of the silent auction. Please note that ALL cards/projects WILL BE REPOSTED seven days after their initial post. The auction will end at 8:00 p.m. Mountain Time seven days after the first post. Near the end of the bidding you may not see bids as they come in. Most blogs have a comment feature where the blogger must approve comments before they are published. So bid high. Yours might be the highest bid. I recently mentioned as we were preparing for our trip to Italy that I had gotten a traveler's journal. 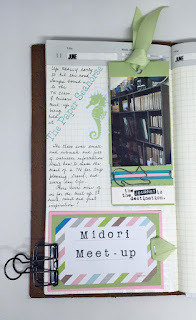 Since first discovering the Midori about two months ago, I have been totally smitten! I have the original black standard size Midori that holds the inserts I took to Italy, a passport size notebook that I use to keep track of the everyday things that go on in our household (master calendar and notes), and recently started journaling in an insert that I'm using for art and daily journaling, what many would call my "Every Day Carry." 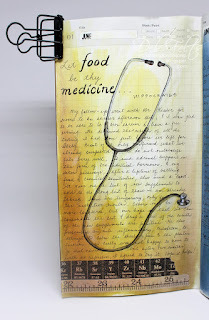 As June began, I joined several challenge groups on Facebook/Instagram, including #rockyourhandwriting, #planwithme, and Every Day in June sketch challenge. I joined in the hopes that I can improve my sketching, as well as my handwriting for titles and journaling. Ideally, some of the challenges can be dovetailed together, but we'll see how that works out! Admittedly, I'm a little intimidated by the thought of missing a day and having a blank page in this dated insert...which should help me to stay committed, although definitely there are days it's hard to squeeze in, so some days get skipped and others I'm playing catch-up. The whole idea is to challenge myself to learn and improve, and to have some documentation of Life in the process. I had an appointment with my functional medicine doctor on June 1st, so for my first entry of the month I sketched a stethoscope and journaled about that visit. The following day was spent making appointments and ordering the supplements that Dr. Kessler had recommended, and included a nice lunch with my sweet son. I've been plagued by plantar fasciitis so I haven't been walking much since we returned from Italy, but Friday I spent the day in search of art supplies and it was nice to be out and about. Hopefully the anti-inflammatory Dr. K prescribed will work its magic and I won't pay later by having to hobble about on sore heels! 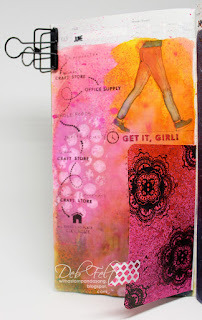 I mapped my long shopping expedition on this layout which was inspired by my bright, fun dream-catcher Onzie leggings. Sketching and watercolor are unfamiliar territory for me, so it's nice to include something familiar like inks, sprays, washi tape and stamps in these layouts. 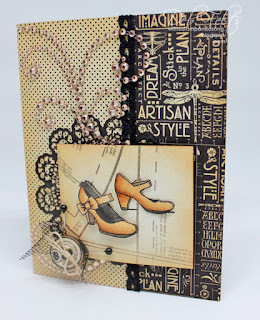 Most of them are Kelly Purkey planner stamps, along with a few from Impression Obsession, and W plus 9. There's a bit of scrapbooking, stamping, bullet journaling, and ink/watercolor in each one. I'm still working out exactly which insert I prefer and how I want to use them. It's loads of fun. I'll be back periodically to post some of my sketches and layouts from the various challenges. 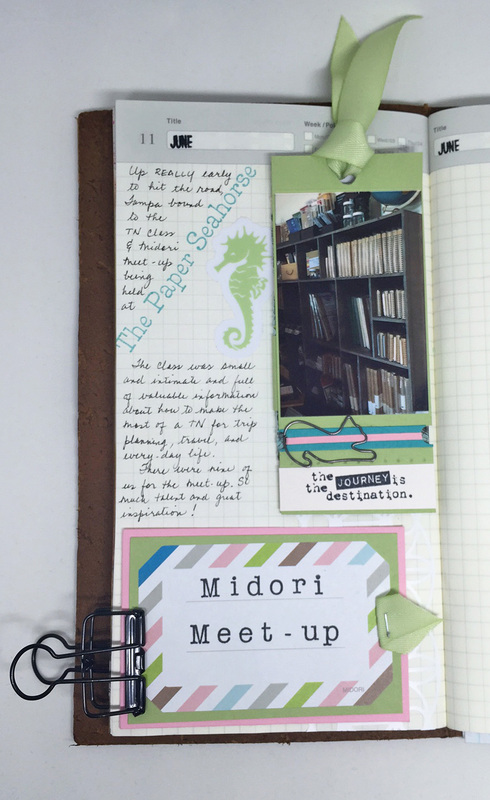 If all goes as planned, I'll be headed to Tampa to The Paper Seahorse for a Midori Meet-up! 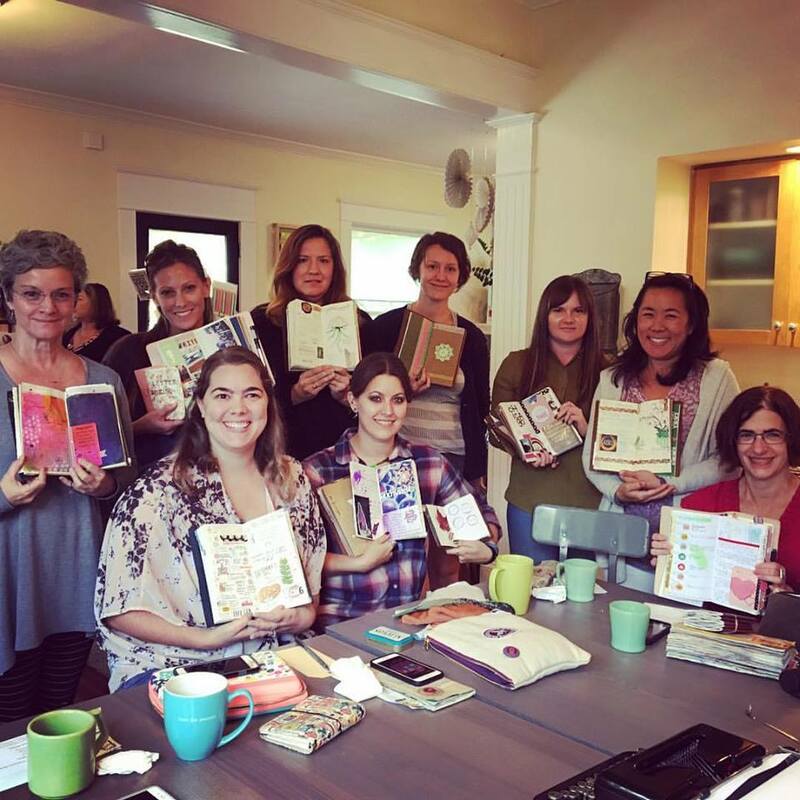 It will be fun to see others' art, how they use their planners, and to share ideas. I know it's barely June so it's a little early for Christmas in July, but some of you who are really clever, organized people stamp a few Christmas cards each month, so I'm sharing one of the flat-backed resin cards that I made last month featuring Santa's Suit. When the big guy (or one of his helpers) finally gets done for the night, it's time for congrats for the huge job well done and then a little relaxation. That's when the suit goes to the cleaner's and then right back into the closet until next Christmas! A few snips off of a silver hanger brad with some sturdy, not-so-precious scissors and then a little dab of glue, and it's all set. An easy-peasy Christmas card that shows how much he's appreciated! Santa's Suit comes four to a package. The hangers come by the dozen, and they're really cute with stamped images too! They'd make a cute summer card with some beach towels and bikinis!